Above Ron in what was the madam's room. The Blue Belle Saloon was originally built in 1893, and the original structure burnt to the ground and was rebuilt in 1899 .The tile floor is the original flooring and is quite nostalgic. Tom Mix, famous for his roles in silent films, tended bar at this Saloon which was frequented by the locals as well as affluent business owners and statesmen. If you look up at the tin ceiling you can spot a few bullet holes from trigger-happy patrons. Directly above the Saloon is Miss Lizzie's Bordello which suffered a fire almost two years prior to our investigation. According to Vivian, the owner of the building, many folks hear someone walking around in the upstairs area late at night when no-one is in the bar. Many of the people who have worked there say the doors on the main floor would open and close when no-one is there [at least no one we can see]. There is a curtain by the end of the bar area which leads to another large room now used used for storage. There is a full basement downstairs complete with a second bar area and pool tables where you can still play pool for four bits [50 cents]. The basement was dug out after Vivian purchased the property, and she says a very cold spot could be felt at the time of the renovation, which was during the summer months. The Blue Belle is rich in history, but sadly has been closed since this investigation. It is sad to loose such a rich part of the history of Guthrie! 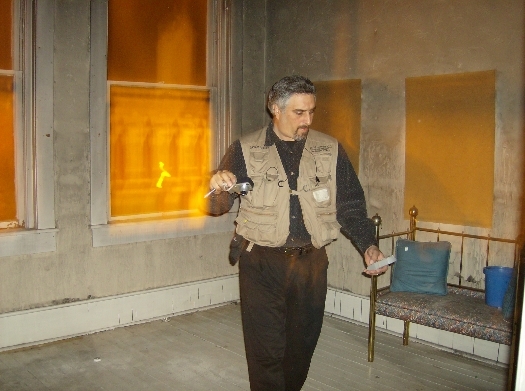 The first EVP to the left was taken on the way downstairs from the Bordello to the Saloon's main floor. You will hear a cantankerous man sternly ordering Ron "don't take the picture !" This male voice followed us during most of the investigation and was very angry every time he speaks. There was a quiet female that came through in the basement area which has been converted into a bar with pool tables. This female comes through at the very end of the investigation when asked if they have a message for Vivian the owner. In a sweet voice the girl says "I'd like to kiss you?" There were many more EVP collected at this site but many were low clarity. [class C] EVP. The PROS Team re-visited the Blue Belle Saloon on the 10th of May, 2008 after the location had closed. We met the owner and took in our equipment and prepared for the nights investigation. It was to be a long evening due to the fact we had already visited Ft Reno hours prior to this investigation for their Candle Light Tour. We quickly completed our pre-investigation baseline tour of the location and down loaded the audio files to our computers for a fast review to determine our focus points for the nights investigation. We quickly found several EVPs in the upstairs area which served more than a drink to patrons looking for a good time in the distant past. We gathered our equipment for the investigation and placed voice recorders, motion sensors and a digital camera that activate by motion as well in the down stairs bar area. Once we secured the area and equipment the team ventured upstairs for a sitdown in the area where the majority of the EVPs were captured during the pre-investigation. Once we reached the upstairs we sat out our equipment and voice recorders in the area surrounding the team. We settled in to our chairs and began to ask questions directed at those souls who still seemed to have an interest in the bar. We quickly noticed there were many sounds created by the wind outside. Tony and Judy felt a cold spot which the team could measure with our equipment. Tony also remarked he felt someone/something pass by. At that time on the voice recorder a low volume EVP seem to say " I'm here." More than once the team seemed to hear noises that came from inside rather than outside. The sign which squeaked due to the wind blowing did add a touch of strangeness to the investigation. Karen at one point commented that the noise the sign managed to produce seemed like the voice of a woman at times. Tony at one point said he heard what sounded like someone walking away from the area upstairs was captured on one of the recorders. More detail to be added soon with evidence. There were many class C EVPs captured in this location. This is one of the clearer one, which seems to say "Get out."